What are signs of a healthy digestive tract? No upper indigestion or acid reflux (heartburn). Little or no regular gas, bloating or flatulence. Regular soft and formed bowel movements once or twice a day. No partially digested food or oils in the stool. No intestinal cramping or pain with foods or with defecation. No joint pain or stiffness. No skin problems. A healthy physical exam and appearance in general that reflects good nutrition. The digestive system is the root of all health. It’s where you get nutrition for every cell in your body, including support for your immune system. If it is irritated, inflamed or constipated, it cannot do its job, and your health will steadily decline as a result. Poor absorption of nutrients, which affects overall natural body function and health. In many cases your weight may increase at the same time you are starving your body of the nutrition it needs. Compromised immune function, chronic infection and triggering of autoimmune diseases. Food Sensitivities or Food Allergies. Progressive deterioration of the intestinal wall, leading to such problems as leaky gut syndrome, irritable bowel syndrome (IBS), diverticulitis, Crohn’s disease, and others, that together affect millions of Americans. Systemic Imflammation, which contributes to heart disease, arthritis, joint pain and muscle stiffness, skin disorders such as dry skin, adult acne, rosacea and psoriasis, and more. Literally millions of women are affected by these disorders. Unfortunately, most health care practitioners have little training in digestive issues. Many drug therapies only treat the symptoms. Why such an epidemic of problems? The underlying major cause is poor nutrition, which leads in time to imbalances in the intestinal flora of the gut. Most of us don’t realize that the friendly bacteria that reside in our digestive tract are effectively an organ of the body. And a big one — each of us has over three pounds of bacteria in our small intestine! The conventional high-carb American diet, heavy on sugars and processed foods, is really a formula for dysbiosis. 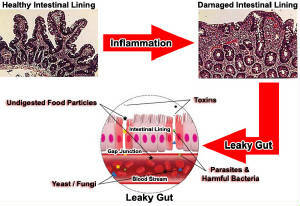 Leaky gut is an increased permeability of the lining of the small intestine. I am going to discuss leaky gut from a much broader, looser definition to include not just permeability but also including some of the other digestive contributing factors of decreased stomach acid, decreased digestive enzymes, dysbiosis (imbalance of good and bad bacteria and increased yeast), parasites, food sensitivities / allergies, and inflammation. 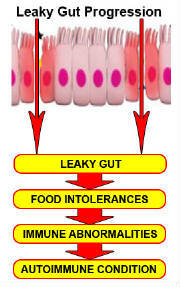 Everyone that has an autoimmune disease has “leaky gut”. All of these are signs of impaired gut function. What can you do for healing your digestive tract? The correct medical grade supplements and phytotherapy.